Measuring and grading balls used to be a very tiring and time consuming task. The closer a group of balls are in size to each other, the better the "grade" or rank, and usually the better the final performance of where that group may be used. But to get the balls graded meant hours behind a tiny dial, with cramping fingers on tweezers, and blurry eyes after time. So we needed to find an easy, and fast way to improve this labor intense process. Our engineers took the challenge and improve it they did! Studying the process, we quickly realized that loading the ball, moving it to position beneath the gaging contact, and then exiting the ball from the area was the root cause of the time, and effort associated with this process. Couple this with trying to decipher an analog needle between marked graduations, there had to be a better way. So we first devised a two position arm that would allow for loading of balls by hand, rather than tweezers, away from the measurement contact, that could quickly allow for exiting the ball after measurement. With a vee block locator within the arm, the ball now stops in measurement position with ease and speed. And once measured the second position of the arm allows the ball to drop into a nylon chute below, again, away from the gaging contact. To ease the measurement decision, we applied our Accusetter II column amplifier. The 10" bar graph is easy to observe with instant determination of size. Or, the user can read the absolute values of size in the digital display that can also be programmed to display a rank size from 1 to 10. No more squinting. And at the press of a footswitch, the data can be recorded for recall at a later date. 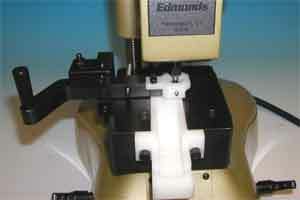 The Edmunds Ball comparator reduced fatigue, increase efficiency, and improved product grading by making the process easier on the operator. Now this customer is able to provide better grades of balls to their end users, without a great expense. 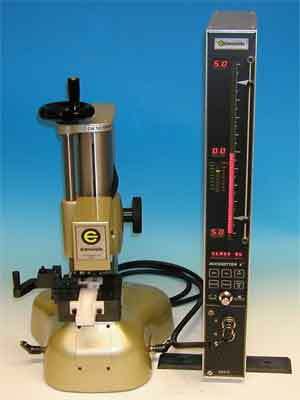 FEATURES: Simplifying the measurement and classification process of balls with ergonomic considerations that come standard in the Edmunds Ball Comparator.